A short but intense horse ride: 5,5 days on horseback out of an 8 days tour. Short road transfers: just 60-90 mn from Ulan Bator. Beautiful and wild landscapes (steppes, forests, valleys ...), as we ride far from touristic sites. ** NAADAM FESTIVAL: stay 1 or 2 extra day(s) after your tour and visit the Naadam Festival, including 1 or 2 night(s) at Dream Hotel + a guide (non private) + grouped transfers (no lunch, no dinner, no entry fees included). Day 8: Transfer to Ulan Bator airport on time for flights departing after 07:10am. Groups of 1, 2 or 3 riders: + 180 € / pers. + 40 € / pers. (1 night in Ulan Bator only). Tour and visits as described, horseback rides as described, full board from dinner of day 1 to breakfast of day 8 except 1 dinner, English speaking translator, Russian 4x4 with driver, a cook per group over 4 persons, nomadic equestrian guide, financial guarantee of your deposits. Dreaming about galloping in Mongolia, but you can't leave for 2 or 3 weeks? This ride is for you! Less than 2 hours from Ulan Bator, you will find willing and endurant horses, awaiting you for an intense ride in the steppes. Immediate departure for the Mongolian Steppe! For this first night in Mongolia, you will sleep in a yurt camp in the wilderness (up to 4 riders per yurt - showers in a separate building). 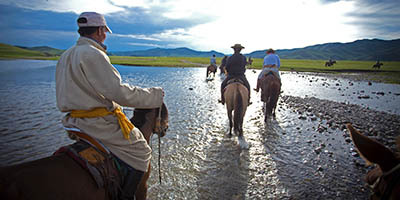 5 days on horseback in the typical lanscapes of Central Mongolia. For this ride, we have selected the horses of a breeder who takes part to many Naadam races (he is a member of the Mongolian Equestrian Federation). His horses are fast and endurant even all of them are not always race horses. Many nomadic families live in this region, with their yurts and their herds of horses, cattle, goats and sheep. You will have the opportunity of discovering their traditional way of life. You will camp close to a nomadic family at least one night during the ride. The pace of the ride is quite fast, as the support vehicle carries all the luggage and joins the group for lunch and at the end of the day. You do not have to carry anything on your horse, which allows long and fast gallops in this very open terrain. Dinners and nights in tents. We chose the camping sites carefully, once in the middle of nowhere in huge steppes, another night close to a river, another night in the forest where we often hear wolves, and one night close to a nomadic family. 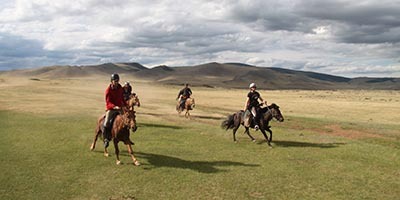 Last half day on horseback in this beautiful part of Mongolia. Transfer to Ulan Bator, the rest of the afternoon is dedicated to shopping downtown, where you will find traditional clothing and objects of daily life. 1 night in a 2* hotel in Ulaanbaatar. "We created this equestrian tour for the riders who want to visit Mongolia on horseback but can not afford to take long holidays in summer. In 8 days, you will experience the best of what Mongolia has to offer to horse lovers: great gallops in the steppes, a night in a yurt, encounters with nomads ... Unbeatable value for money." "The bravest horse I have ever met, a very comfortable saddle, nomadic equestrian guides always checking that everything is OK ... Our guide was great, always smiling. Beautiful and varied landscapes.